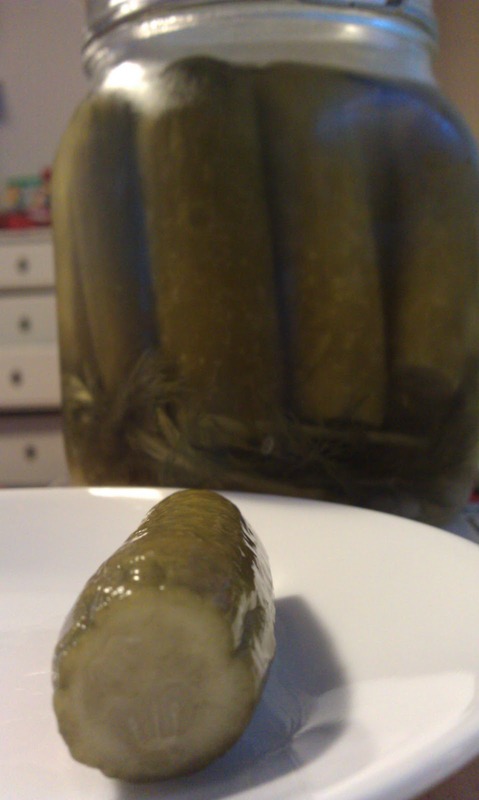 We caved in… opened a jar of pickles that was supposed to keep brewing until Friday – oops! But not oops at all, because they were DELICIOUS! We had them for lunch with crumbled fetta cheese and sauteed salami and mushrooms. Yummy. Before I get started on the recipe itself, just a few notes in regards to the method, ingredients etc. You can pickle cucumbers just about any way you want. The most common ways of cutting the cucumber are not cutting it at all (pickling the whole cucumber – you need small baby cukes for this), slicing them into spears, or slicing them into rounds. To slice them into spears, stand them on one end and slice down; rotate the cuke 90 degrees and slice down again, giving you four spears per cuke. Rounds can be done two ways; slice them horizontally for circles, or slice them on a sharp angle for ovals. Doesn’t matter how you slice them, the method is the same. It’s personal preference, really. I prefer whole cukes myself. My dad does too – I called him up and asked him today, and he said he prefers them whole because then he can decide how to use them – i.e. he still has the freedom to cut on up if he wants to. In America it is quite common to be served a pickle spear on the side with a burger and ‘fries’. Pickle slices are also commonly put on burgers etc. But pickles are for more than just burgers! They’re great as a replacement for potato chips – they’ll satisfy your salt craving, and if you pickle it right you still get to eat something crunchy! You can also chop them up and add them to salads, the possibilities are endless. In terms of the actual pickling process, there are several ways to do it. You can cook the pickles in the brine and can them hot. You can cold-pack the pickles and pour the hot brine over them (this is what I do). And some people then put the canned pickles into a water bath to be extra safe (I typically don’t bother with that extra step, but that’s really just because I don’t have the right tools to do so). And in terms of seasoning, you can add anything you want. Plenty of people add chilli (I don’t, because if I did Mr T would not touch them). Sugar is also popular (sweet and sour pickles). As is coriander, mustard seeds, cloves… Anything your heart desires! I personally would stick to whole spices (i.e. not ground spices), but that’s purely for aesthetics – I don’t like to see powder floating around in my brine, and envision pulling a pickle out covered in wet granules of ground spices. I’m a bit of an oddball when it comes to certain textures. I’m probably being melodramatic, but nevertheless I still prefer whole spices. The recipe I’ll post is for ordinary dill pickles – if you’ve never pickled before, I’d recommend starting with this and branching out once you get a feel for the process and the end results. Okay, now for the important part! 1) Sterilise your jars and lids. 2) Cut 1-2cm off the flower end of each cucumber (this will prevent soggy pickles). The flower end is usually lighter in colour; if you’re unsure which end is the flower end, cut off both. If your stem end looks a bit dodgy, cut it off too. 3) Cut the cucumbers whichever way you want them (leave them whole, or cut them into spears or rounds). You can do a mix in each jar, too. If you’re cutting into spears or using whole cukes, make sure they are a couple of centimetres shorter than the height of the jar. 4) Put water, vinegar and salt in a saucepan or thermomix bowl. Boil (covered) for at least 20 minutes, stirring occasionally. If using a TM, cook on 100 degrees, speed 3-4, for 25 minutes. 5) While the brine is boiling, prepare the jars. Put 3-5 cloves of garlic on the bottom of each jar, depending on how much you like garlic. Perhaps start with three per jar the first time you pickle. 6) Put a sprig or two (a small handful) of dill in with the garlic. 7) Tightly pack the cucumbers into the jars (it’s easier if you hold the jar on an angle, so your cucumbers lay against the side of the jar). If your whole cucumbers or cucumber spears range in size, start with the biggest ones and pack the smaller ones around those. Once the jar starts getting full, give it a jiggle to creat a bit more room, and pack in more until you can’t squeeze anymore in. If you have leftover cukes and a teeny bit more room, you can always pack sliced rounds of cucumber into the gaps. 8) If you finish packing your jars before your brine is ready, put the lids on the jars (you don’t want dust etc ending up in there). 9) Once the brine has boiled for a while, pour it over the cucumbers. 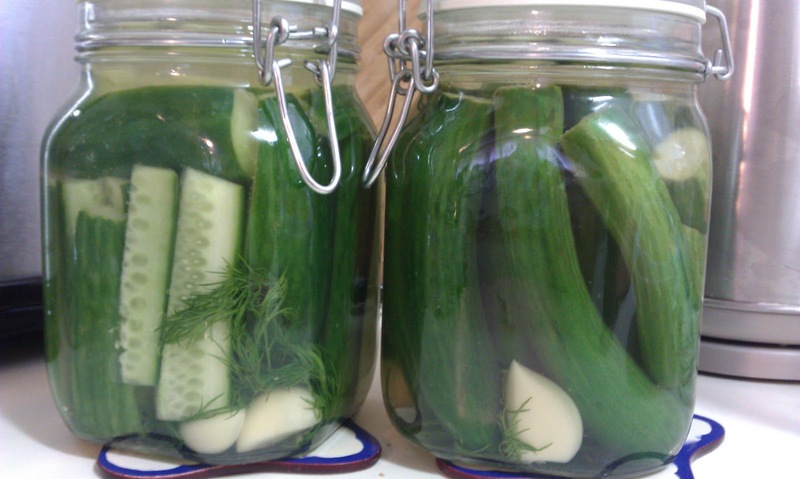 You need to cover the cucumbers completely with brine, but leave about 1 or 2cm of airspace at the top of the jar. Seal the jars, and leave them out on the bench to cool. Once cooled, store the jars in a cool, dark cupboard and leave to let the flavours develop for a week. The jars should keep in the cupboard for about 6 months, but once a jar is open it needs to be put in the fridge and consumed within 8 weeks. If any of your jars don’t have an airtight seal once they have cooled, put them in the fridge right away and eat those before the others (they’re still okay to eat, you just don’t want them hanging around in the cupboard if the jar didn’t seal properly). This seems like a long recipe, but it is so easy to pickle your own cucumbers. The recipe is only long because of the tips and hints. If you haven’t pickled before and are nervous, there are plenty of pickling videos on youtube, so head over there and have a browse to boost your confidence. It’s well worth the end result, they are so yummy! And completely preservative/additive free! ***If you are a little sulphite-sensitive, like myself, make sure you are buying vinegar that has no added sulphites. The best vinegar is organic raw unfiltered apple cider vinegar. It’s pretty murky stuff, but has more health benefits because it has all the good stuff in it. I’d recommend buying no added sulphite anyway (usually organic), otherwise your pickles won’t be additive free and you just never know what effects the sulphites may be having on your body. Happy pickling!